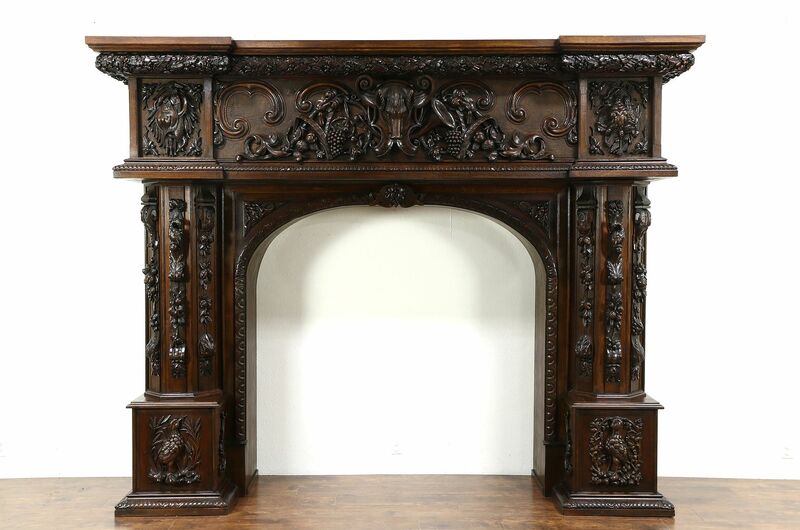 Carved Oak Antique Fireplace Lodge Mantel or Archway, Animal Sculptures 10' 5"
A monumental fireplace mantel and surround or archway includes architectural salvage from a chateau in France. Three dimensional sculptures include birds, fish, fruit, grapevines and a boar's head, the upper frieze is carved oak leaves with acorns. This work of art has a Black Forest, country manor or hunting lodge design. The three large oak cabinet components were rebuilt and given a new finish in the 1970's when this was imported from France. Three dimensional oak sculptures and moldings date from around 1870 and have their original finish. Waxed and buffed, all that is needed to maintain the rich luster is an occasional wipe with a soft dry cloth. This massive piece breaks down to three large sections, the topmost section requires four men to raise into position and must be anchored to the wall for stability. Dimensions are 10' 5" wide, 34" deep and 8' 4" tall, the opening is 68" wide and 66" tall.